Cooking & Eating Lobster - Erica's Seafood, Inc.
Now that you have purchased your lobsters it's time to cook and eat them. 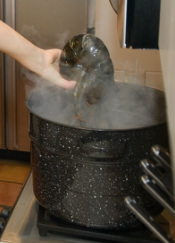 Lobsters can either be steamed or boiled, but we prefer to steam them. We like to use our propane burner or otherwise known as a turkey fryer to steam them on. Make sure you have a pot big enough for all of your lobsters. 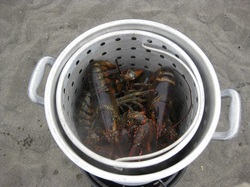 We like to use a steamer basket that fits in the pot for the lobsters. It makes taking them out of the pot when they are done easier. Add about an inch and a half of water to your pot and bring it to a rapid boil. If you can use sea water, if not salt your water. When the water boils drop your lobsters in. We like to take the bands off of the lobsters before cooking them. It gives them a nicer appearance once they are done, but it is not necessary. Once the lobsters turn red you can start timing them. For 1 1/4lb to 1 1/2lb soft shell lobsters we time them for 12 minutes. If they are smaller take a couple of minutes off, and if they are larger add a couple of minutes. For 1 1/4lb to 1 1/2lb hard shell lobsters time them for 15 minutes after they turn red. Use the same time rule as above for smaller or larger lobsters. A good test rule for when they are done is if you grab them by an antenna it should fall off easily. Drain them and enjoy! Step 1: Separate the claws from the lobster by the body. Break the knuckles away from the claws and then you can use lobster crackers to break into the claw. Step 2: Separate the tail from the body of the lobster by twisting it. Break the flippers off of the end of the tail. You can then use your fingers or a fork to slide the meat from the shell. Once the meat is free, pull the top part of the tail meat off and clean out the intestinal tract. Step 3: There is meat in the flippers, legs and body. Break them at their joints. Some people also enjoy the tomalley (the green stuff) and the eggs ( the red stuff).